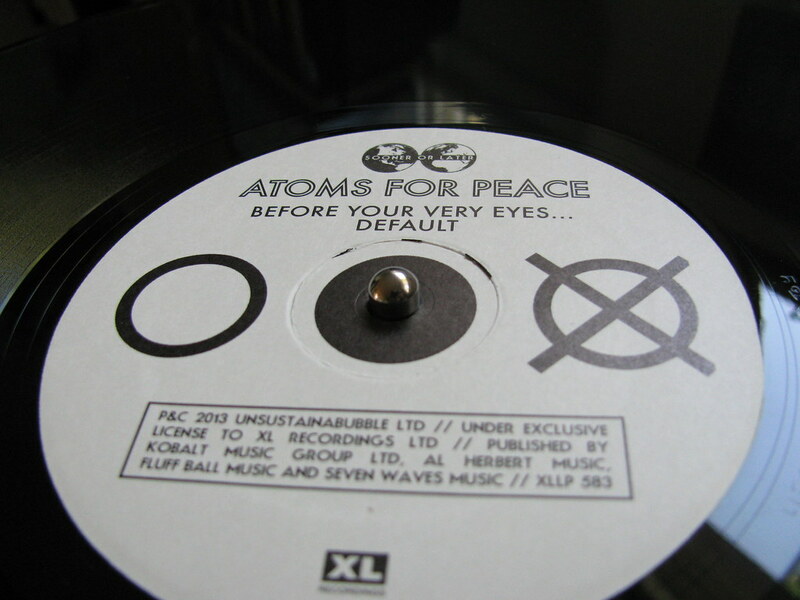 Atoms for Peace is an experimental electronic/rock group comprised of super-star musicians. Radiohead’s Thom Yorke heads the band with vocals, guitar, and piano. Other members of Atoms for Peace include Flea (bassist for the Read Hot Chili Peppers), Nigel Godrich (Radiohead producer), Joey Waronker (drummer for Beck and R.E.M. ), and Mauro Refosco (Brazilian percussionist). There was a lot of hype leading up to the release of AMOK. Yorke and Godrich even took to reddit to do an AMA (ask me anything) to talk about Atoms for Peace and Radiohead’s new music. Was the hype deserved? Read on to find out. I will be reviewing the standard double LP of AMOK [XLLP583], not the deluxe 180g double LP. The packaging of AMOK is minimal. There’s no art included, just a little MP3 download card, which is nice. There’s no poster, artwork, or lyrics included. The LPs don’t even tell you the order they are meant to be played. This makes sense as the songs blend into one another, no matter what order they’re played. The back of the jacket reveals that there are 9 songs on two LPs and no mention of rotation speed. This gave me a bit of a surprise when I first dropped the needle. Everything was slow because AMOK was meant to be played at 45 rpm. Switching to 45 rpm, everything sounded as it should. The first track, “Before Your Very Eyes…” offers a great overall feel of what the album will sound like. Bass and synths hit hard and Yorke’s voice provides a haunting melody that blends into the background, sometimes making him disappear completely.This track provides a preview of the complex layering going on throughout the album. Lyrics are minimal and repeated often but it that’s just as well since the star of the album is the layered bass line found in every track. AMOK will put listeners into a trance-like state. Yorke’s voice provides a haunting melody that blends into the background, sometimes making him disappear completely. One of my favorite tracks on the album is “Ingenue” as it provides acoustics I never noticed on the digital version. There’s a very faint melody played in the background at the beginning of the track that permeates throughout the rest of the song. It’s small details like this that make AMOK interesting and so complex. The sonics of AMOK are amazing. The background is nice and quiet with no hiss and the dynamics aren’t compressed at all. Bass slam is excellent and the record reveals instrumental texture brilliantly. Yorke’s falsetto rings with a haunting echo in many of the tracks, allowing the listener to get a sense of space. AMOK is beautifully recorded and mastered. AMOK is not a knockout record. It feels much more reserved and indistinct.Still, AMOK is not a knockout record. It feels much more reserved and indistinct, especially when compared with Yorke’s The Eraser. The thing is, fans of Yorke know he’s capable of great lyricism and vocal ability but none of the songs on AMOK allow him to let loose. The story is the same with Flea. You know he’s a great bassist and that he can definitely carry a solo but it never happens. AMOK has great potential but the final result is a bit disappointing. Don’t get me wrong, it’s a solid album, but it never really reaches brilliance. The artists feel reserved and at times lethargic. The reason AMOK’s songs flow from one to the other is because none of them stand out. After listening to the album a dozen times, I still can’t remember what each track sounds like. With The Eraser, I could easily remember how my favorite tracks, “Black Swan” and “Harrowdown Hill,” sound like. Hopefully Atoms for Peace can let loose in their sophomore album.